Today, Microsoft became the most valuable company in the world, surpassing Apple for the first time in years. Well, for a few moments anyway. 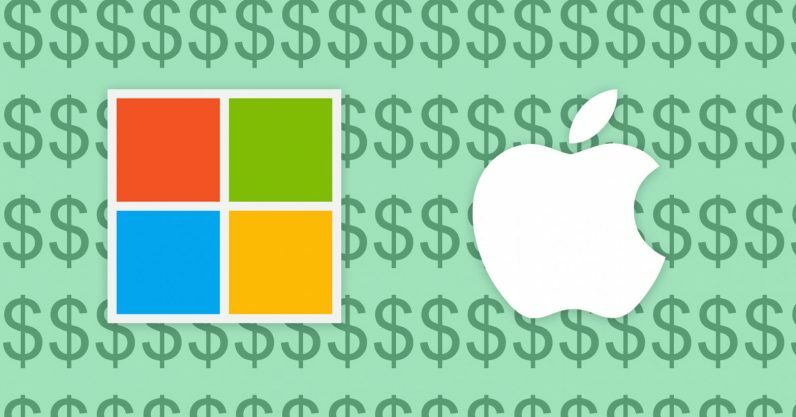 Microsoft briefly overtook Apple’s market value during trading hours, but as of writing, it’s a bit of a wash. Apple closed at 828.64 billion, while Microsoft sat at $822.90 billion, according to Bloomberg. It’s notable nonetheless. It’s been eight years since Microsoft was ahead of Apple, having fallen behind in 2010, but it’s seen success from an increased focus on cloud and the enterprise. You might remember that Apple became the first trillion-dollar company earlier this year, but those gains have been erased in the past several weeks. It’s been a rough patch for tech stocks in general, but Microsoft has held up pretty well. There could be further difficulty for Apple, as the company warned phone sales might be lower than analyst expectations. Rich Ross, a technical analyst at Everscore ISI, said Apple could see another 18 percent slide. There’s a chance Microsoft could take a more substantial lead in the days and weeks to come. Microsoft has lost some public mindshare to Apple in the past few years as the Android vs iOS battle became as important at the Mac vs PC one, and Microsoft failed to capture the mobile market. But under Satya Nadella’s focus on the cloud and enterprise, and with some success from its Surface and Xbox hardware, it seems the company is doing just fine. At least where money is concerned, the Microsoft vs. Apple rivalry is as fresh as ever.